On Tuesday, June 5 at 6:30 pm, I will be reading from my new novel in the Terrace Room in Margaret Jacks Hall (Bldg. 460, Room 426). The event will also feature an art exhibition by Robert Negrete, the artist who has been working with me to illustrate various moments from the novel. The reading will last approximately one hour, and then refreshments will be served. 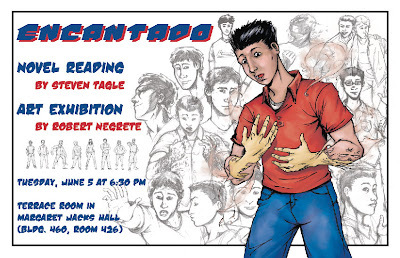 ENCANTADO is a coming-of-age novel that I have written as my creative honors thesis in Feminist Studies. The novel follows the adventures of Simon Knight, a young man who develops the ability to shapeshift during his senior year of high school. By engaging feminist theory and the origin stories of mainstream superheroes like Superman and Batman, my novel explores the myths surrounding masculinity and male friendship.